Apparently the kids deemed yesterday to be “clean up day” and for some reason I just happened to take pictures of everything. Ivy decides the only thing she likes at lunch is sour cream – unfortunately it’s rather messy to eat with your hands. 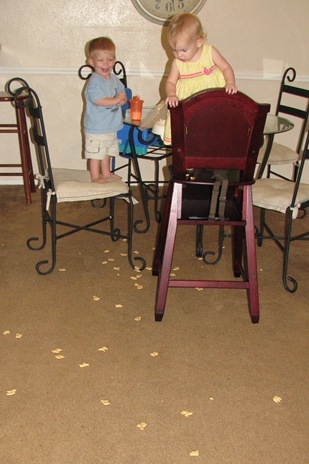 Lance decided he didn’t like anything and while I was cleaning Ivy he threw his food on the floor. 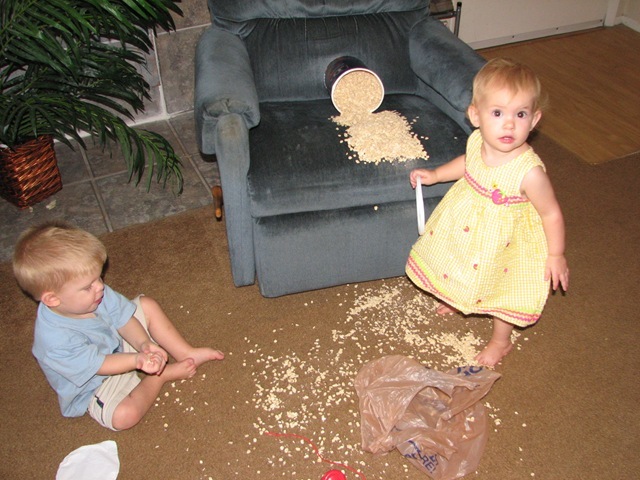 Oh well, I needed to vacuum anyhow. I do the whole front room, thinking to have a clean house when Daddy comes home. After lunch Lance gets into the food closet and scatters grain everywhere. The vacuum comes out again. 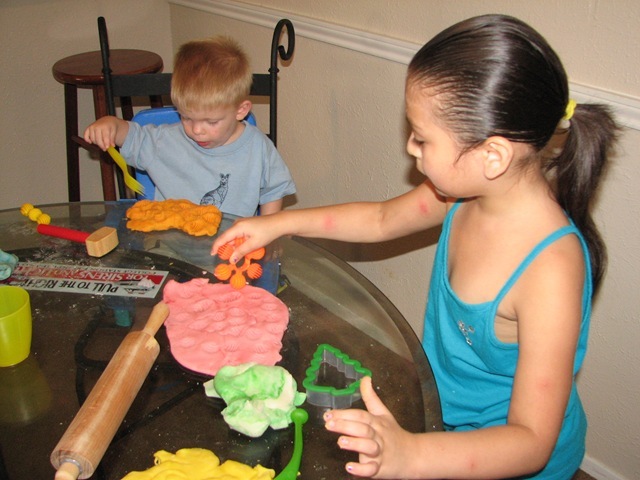 A few hours later we have playdough everywhere! I babysit the two kids from downstairs for a few hours several days a week and decided to make playdough with them. Fun project but rather messy. At least Ivy didn’t eat any. The neighbor kids had left and I just finished picking up the toys and playdough bits then sat down to do a little vacation planning when I heard a funny noise and came out to see the kids found a new form of entertainment. Oatmeal I had just bought for tomorrow’s activity. I try to scoop and vacuum it up even as Lance wildly tries to throw it everywhere. Now it’s 5:00, the kids are whiny because they are hungry but we’re waiting on Daddy so I give them some milk and animal crackers for a snack while I again try to do a little vacation planning. Hearing sounds of too much fun I discover the kids must be done with snack. This time though, I make them help me pick up all the animals. This is a slow and rather tedious undertaking. Daddy finally arrives and we go out and get free hamburgers. We’re both tired when we get home and are happy it’s almost bedtime for the kids. Brian offers to run them through the shower but when I go to find them I discover my day isn’t quite over. 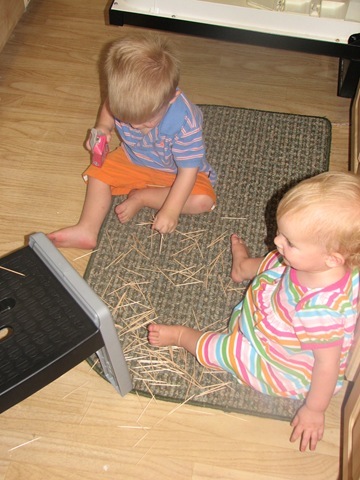 Lance used his new stool (still in the kitchen from the playdough cooking project) and got a box of toothpicks off the counter. How fun! Getting all the toothpicks back in the box is even more tedious than animal crackers but that’s what we did. Daddy even came and helped to speed things up a little. Finally we got the little rascals bathed and in bed. Sigh. Is life monotonous as a stay at home mom? No way! Look at all the different situations I faced. They might be variations on a theme but each mess is unique. 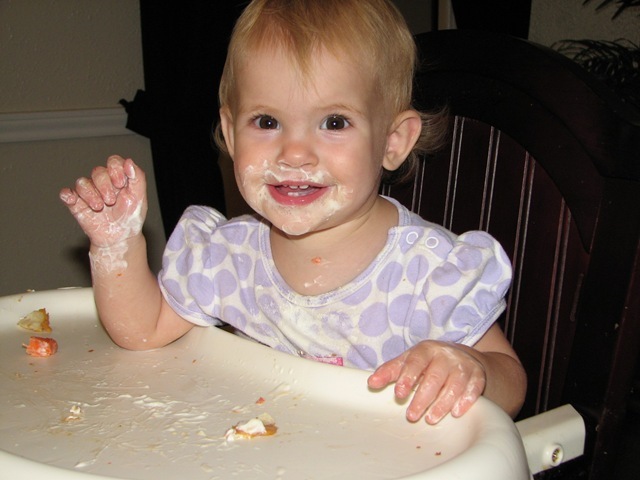 And interspersed between all this activity were trips to the potty for both kids and only one accident (Ivy) all day! Now that makes a mom feel successful!